There’s a shrine to Hank Williams in the back of the Double Crown, a dive bar on the forgotten end of Haywood Road in West Asheville. Pictures, record covers, mementos, candles—all tucked behind some wire mesh taking up valuable real estate in the skinny hallway leading to the bathroom. It’s a little unexpected, but then again I’m drinking bourbon with apple butter in it, so maybe I shouldn’t be surprised. The drink is called an Appalachian Old Fashioned. It’s one of Double Crown’s signature cocktails, blending Wild Turkey with the condiment usually reserved for biscuits at your grandmother’s house. It’s odd, but that’s OK. My buddies and I are searching for the best Old Fashioned in Asheville. We’re open to odd. Seven bars. Seven drinks. Consider it a tour of Asheville’s emerging cocktail culture. In the last two years, a handful of bartenders have infused craftsmanship into the city’s bar scene. Think classic drinks like a Manhattan and bartenders dressed like it’s the Roaring ’20s. This new breed of booze-mongers makes its own tonics and bitters, and hand carves the ice that rests in your glass. 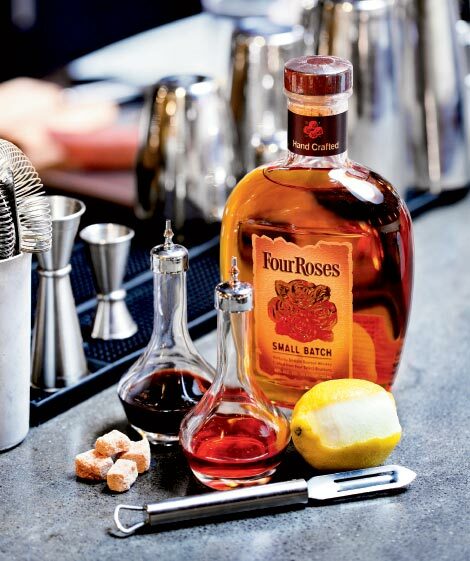 If mixed properly, the Old Fashioned embodies this new lust for classic beverages. The Double Crown is the kind of dive bar you’ll only find in Asheville and the first destination on our crawl. The barkeeps wear trucker caps, and there’s a DJ spinning classic hip-hop. We’re the only people in the place wearing ties and jackets. Typically, I’m not a tie guy, but we’re seeking serious liquor. It felt right to dress seriously too. My cohorts for the evening: Dusty, who is prone to posting bow-tie portraits on Instagram, Kevin, a painter with a strong appreciation for Kentucky bourbon, and Jeremiah, we call him “The Vegetarian” for his refusal to drink liquor of any sort. Plus, he is a vegetarian. The rules of the quest are simple: Only one drink per stop. If a bar has a signature take on the Old Fashioned, we’re obligated to order it. Which is why we’re drinking Wild Turkey with apple butter. The drink gets progressively milky as you work toward the bottom of the glass, but it lays a solid foundation for stop No. 2, where the Old Fashioned contains bacon. The Market Place is better known for its locally sourced entrées than its bar, but the high-end restaurant on Wall Street has an alluring cocktail on its menu—the Benton’s Old Fashioned, made with Benton bacon-infused bourbon and maple syrup. I have a soft spot for anything that combines alcohol and meat into one consumable product. We order three, plus a beer for The Vegetarian. The drink is delicious, but in the way an éclair is delicious. Have too many, and you run the risk of diabetes. Precisely because the drink contains both liquor and pork, I insist The Vegetarian have a sip of mine. The thought of it immediately sends him into convulsions. “I think we should try to find an Old Fashioned without a breakfast food in it,” Dusty suggests, a request that leads us next door to Cucina24. Whenever possible, you should order a serious drink from a man with a serious beard. When we find Donnie Pratt behind the bar at Cucina24, he’s sporting a long, Civil War-era beard and tie-vest combo, like a man straight out of the 1800s, which is appropriate, since the Old Fashioned is a libation straight out of the same century. Pratt’s Old Fashioned is classic. Just the key ingredients and a dark cherry garnish for a bit of flourish. This is a masculine drink, which is probably why the writers behind Mad Men put it in Don Draper’s hands so often—thick lowball glass, mahogany-hued liquor, and a single bulbous rock of ice. In Pratt’s version, there’s nothing between me and the bourbon. While sipping perfection, we watch Pratt make a daiquiri for a woman at the end of the bar. He puts a thick cube of ice in a canvas sack and beats the hell out of it with a wooden mallet. Forget the blender. Fast forward through two bad versions of the Old Fashioned at bars that shall remain nameless. One of the bartenders lines the rim of my glass with various wedges of exotic fruit. I think there’s a kiwi slice on there. The last stop is The Imperial Life, a speakeasy-style joint that always makes me feel underdressed, even if I’m wearing a jacket with a tie stuffed in the pocket. They do everything right here, from the house-made sodas on tap to the hand-carved ice that goes into every glass. The bartenders at I-Life all wear vests and ties and often stand with their hands behind their backs like butlers. As I watch Turner chip away at a hunk of ice with a knife until it’s the perfect sphere of frozen water she wants for my drink, I regret putting I-Life at the end of our quest. It’s 1 a.m. and the only thing I can taste is tomorrow’s hangover. Here are four standouts from the quest for the perfect Old Fashioned. In a glass, muddle sugar cube in water with Peychaud’s and Angostura bitters. Add bourbon and ice. Garnish with lemon peel and cherry.